Opened in 1959 as a thoroughbred racing track, Sunland Park was the only legalized gambling venue in the region for many years. In 1999, at a time when horse racing was experiencing a decline as casinos and lotteries became commonplace, New Mexico legislators allowed slot machines at the track. Now with 700 machines in play, racing at Sunland has benefited greatly, with purses increasing from a $35,000 daily average in the early 1990s to nearly a quarter million per day today. Sunland Park was the track where jockeys Jerry Bailey, Pat Valenzuela, and Cash Asmussen got their start. Bill Shoemaker, who hails from the area, also rode at Sunland. The casino does not offer table games and, unlike most stand-alone casinos, is not open 24 hours a day by state regulation. The racing meet, which features both thorughbreds and quarter horses, runs from December through late April. Live racing is traditionally offered four days each week on Tuesdays, Fridays, Saturdays and Sundays, though the track occasionally races on Wednesdays instead of Tuesdays. Simulcast wagering is offered on tracks across the country daily. The meet is highlighted by the Sunland Derby, run at 1 1/8 miles for three-year-olds in late March of each year. The race was granted a Grade 3 status for the 2010 running and now is an important prep race for the Kentucky Derby--annually run on the First Saturday in May at Churchill Downs in Louisville, Kentucky. The Graded ranking is important because the Kentucky Derby uses Graded stakes earnings to determine which horse(s) will be permitted to enter if its limit of 20 entries is exceeded. Other notable races include the $200,000 WinStar Sunland Park Oaks 1-1/16 miles for fillies; the $150,000 Harry W. Henson Breeders' Cup Handicap for fillies and mares at one mile; the $150,000 Riley Allison Futurity, 6 1/2 furlongs for 2-year-olds; the $100,000 Borderland Derby, a 1 1/16-mile prep for the WinStar; and the $100,000 Sunland Park Handicap for 3-year-olds and up at 1 1/8 miles. 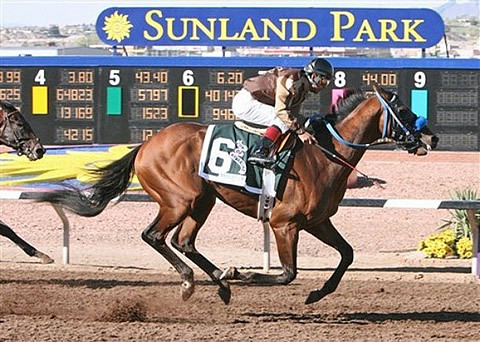 For quarter horses, Sunland's top race is the $400,000 Grade 1 Championship, run late each December at 440 yards. The $300,000 Grade New Mexican Spring Futurity at 300 yards is run in April.